OK. Sometimes, we really do need to find 'the' answer. Recall the scene from Jaws: "It's a shark, not the shark". But in general, seeking 'the' one and only, true, unique, prophetic optimal solution to real-life decision problems is an exercise in futility. It makes sense to talk about the best practically achievable solutions given resource constraints, costs, and priorities, which can then be iteratively refined over time. While filling out a healthcare quiz about better nutrition and weight management, I was delighted to see this question. The health-care researcher who designed this quiz deserves a round of applause. But how do Operations Researchers find such solutions? Sometimes, the problems are provably cute (journals love to publish these). No fear. Well-designed practical algorithmic approaches employing robust, industrial-strength optimization tools like CPLEX can help OR'ers recover high quality solutions to challenging, seemingly intractable, messy-data riddled, real-world decision problems. Losing out on the perfectly good in a quest for the perfect seems pretty silly. RT if you agree, FAV if you don't: Does it work? A simple way of binary polling on twitter that reaches a large number of voters, especially if the polling handle (@H) is sufficiently popular, is to get followers to re-tweet (RT) the message if they agree with the proposition P, and 'favorite' (fav) it if they disagree. 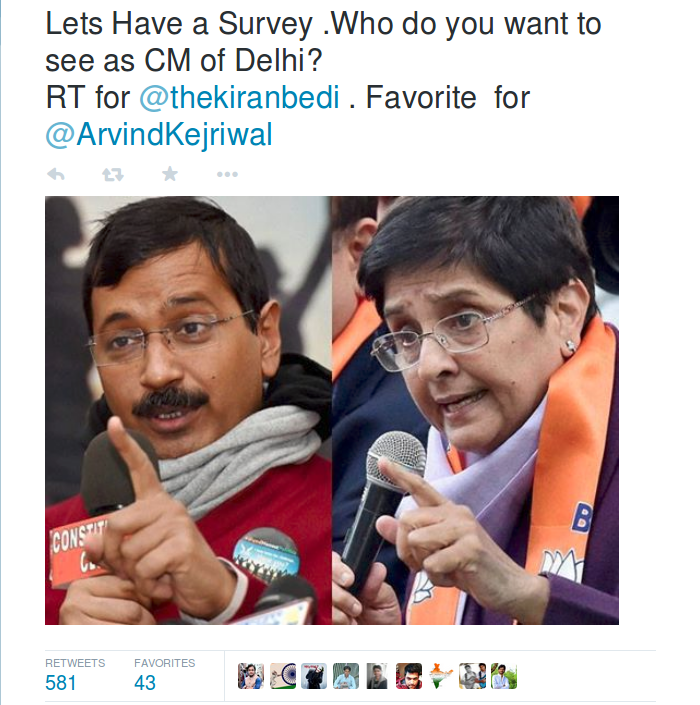 In the above poll, while Kejri is as phoney as they come, the result shouldn't be this skewed. 'Proposition P: RT if agree. Fav and share this msg if u don't'. This additional step may restore some balance. However, the burden of extra work falls on the 'fav' group, and only the enthusiastic 'fav' folks are likely to oblige. The final result may remain skewed in favor of 'agree' but could yield a better result compared to the unmodified polling tweet.